As you enter the stairwell off King West, doubts creep in about the legitimacy of Lavelle’s supposedly swanky entertainment space. Sure, the stairwell has been jazzed up – there’s colourful walls and even artwork - but it still leads to a somewhat dank basement elevator. Rest assured, if you follow the signs and push the right button in the elevator, you’ll soon be whisked up to the rooftop that opens viewing the spacious rooftop pool. Walk along the brightly lit corridor and you’ll soon find the dining area. Should you arrive early, take the opportunity to sit at the bar and enjoy the view - the outdoors consists mostly of cranes and developing condo buildings, but inside the bar’s copper elements pratically gleams and sparkles. 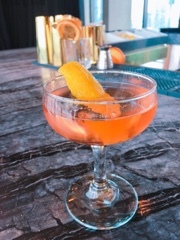 Albeit pricy (a single cocktail can cost up to $30), they concoct them right – the glass is chilled with ice cubes beforehand, certain ones shaken versus stirred. The Puritan ($17), a classic strong drink from the 1890s, is made up of three types of alcohol: gin, green chartreuse and vermouth. Oh you’ll taste the alcohol, especially the herbal properties of the chartreuse. The only respite is the bit of ice that’s melted into it, orange bitters, and the lemon rind that lets off a lovely aroma as you take each sip. Despite discrepancies between the menu prices and actual charges for their appetizers (actual prices shown in post), they’re a fair sized portion and could work as a light meal when paired with salad. 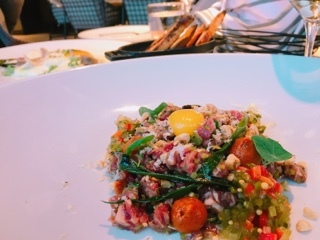 The steak tartare ($21) is a flavour bomb with a zesty kick from the spicy ketchup and horseradish. Finely chopped hazelnut and cucumber add a bit of crunch and bite that’s a nice contrast against the soft beef. 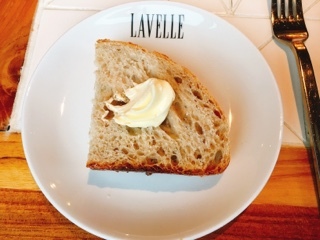 Luckily, Lavelle doesn’t skimp on the crostini so there’s enough pieces to get through the heaping portion of tartare. I’m torn about the cod cheek & leek ($19) starter. 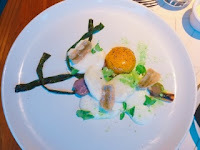 On one hand, it’s beautifully plated and certain elements on their own are delicious: the baby purple potatoes so creamy, the lightly dusted fried smelts a nice touch, and the nori cured duck egg a lovely custard consistency … oh wonderful salty yolk jelly. 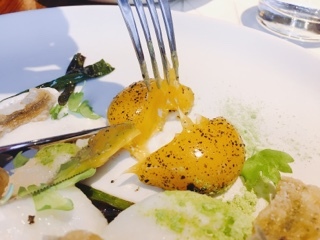 But then the smoked buttermilk foam sort of detracts from the dish and the cod cheek is seriously over salted. Although it looks like a pretty breath of spring air, for me, the elements together is more compost than bouquet. 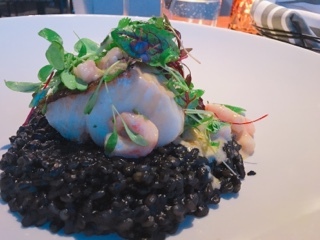 A better seafood option is the Fogo Island cod ($29). The flakey neutral fish went nicely with the thick flavourful squid ink risotto (it stains the teeth, but tastes so good). Unlike the cod cheek starter, the other decorative elements actually enhance the dish – the small matane shrimp adding a contrasting sweetness and the pea shoots a refreshing element. For what seems like a light dish, it has a rich creamy finish that’s just as satisfying as any meat dish. Although I was a little disappointed with the “frites” accompanying the steak frites ($29) – where are thin crispy stringy fries and why have they been replaced with these dense hunks of potatoes? 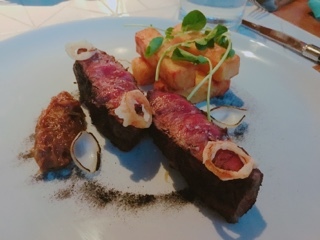 - the flat iron steak was cooked perfectly and the rub on the outside already flavourful enough that the red wine jus wasn’t even required. For such a lean cut of meat, it was also surprisingly tender (probably on account of being aged), while retaining the full beef flavour. 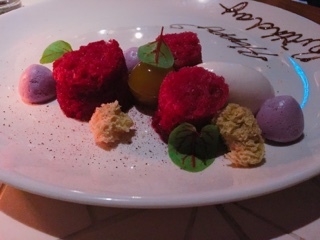 Another fitting spring plate is the lychee and hibiscus dessert ($12). Pieces of cake soaked in a flavourful hibiscus syrup, a cool refreshing lychee sorbet, and crispy hibiscus meringue pieces have enough sweetness to be satisfying while still remaining light. I can see the citrusy floral fruit elements being a hit-or-miss with some guests, but the dessert is different and more interesting than just another cheesecake. On weekends, Lavelle is party central. However, on a weeknight, it’s an oddly serene and calming environment - the half full restaurant offers a lot of personal space and service is attentive but not pushy (feel free to sit for three hours and chat, no one will bother you). It’s nice to go earlier and watch the sun set: from the dining room the view improves and soon the sky glows and the CN Tower lights up. The restaurant was right to describe the rooftop as an “escape” from the city. High above the bustle you start to forget about the traffic and commotion. “What schedule?” you start to think, for now that doesn’t matter and another glass of bubbly is all you need.